Do you have a favorite color of rose? I love the traditional rose colored rose. My hubby likes yellow roses and goes out of his way to include them in our flower gardens as well as any bouquets he orders from the florist. Apparently, there is symbolism connected to the color of roses....here is what I discovered regarding yellow roses - "Long associated with the sun and its life-giving warmth, yellow is the age-old spokes-color for warm feelings of friendship and optimism. In many Eastern cultures, the color represents joy, wisdom and power. But while any yellow flower will send a lighthearted message, the history of the yellow rose in particular has an optimistic, serendipitous character that really makes it the complete package. " How awesome is that? We celebrated our 17th anniversary this week, so I made a card for him, which included Technique Junkies rose image "Long Stemmed Rose" . The card I'm showing you isn't the card I made for my hubby. That said, I colored and designed his card much the same as I did this one. 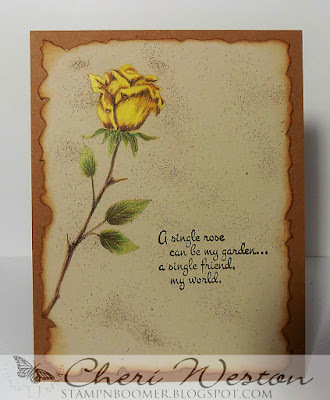 If you like this stamp and sentiment "A Single Rose", (which I thought worked so perfectly with this gorgeous rose image), or any other Technique Junkies Stamps and would like a discount to purchase them, please enjoy my 10% discount code TJ10CHERI for all of your stamp purchases (including the collections of Ken Oliver Color burst powder's). Just add my code at checkout and enjoy! 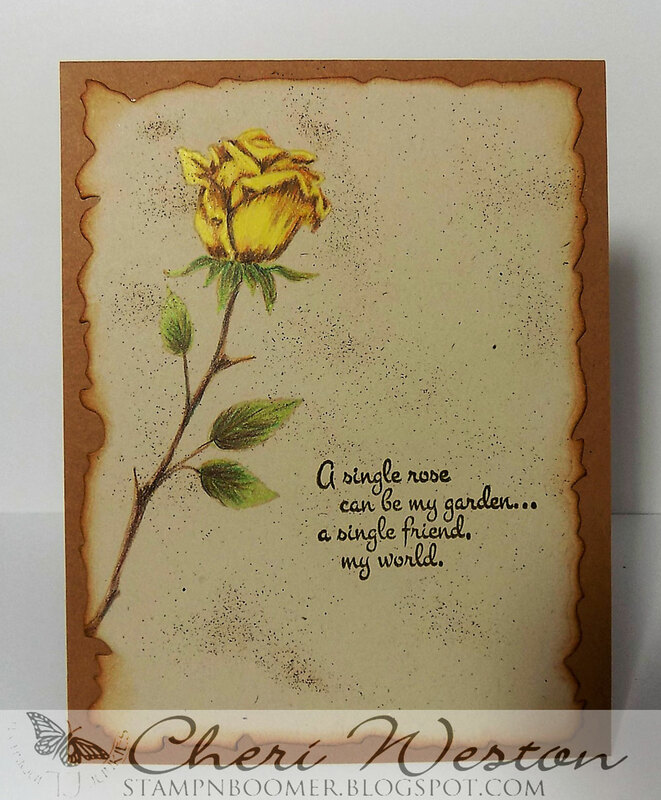 I used my Polychromo pencils to color the rose image after stamping it in Memento "Desert Sand" ink for a no line coloring effect on neutral color card stock. I used a die to cut a frame around the whole layer, inked the edges with Vintage Photo Distress Ink and adhered it to a coordinating cardstock base layer. To finish the piece, I lightly splattered Distress Markers, Walnut Stain and Vintage Photo over the image panel using Distress Marker Spritzer, which I've had forevah! I rarely use it, but I liked the added "something" it gave here on this piece. I hope you like this card and found some inspiration. Please visit/join our FaceBook Page and see all the scrumptious cards and projects people are creating with the awesome TJ stamps. Also...we have a monthly challenge - it's a sketch this month, so check it and I hope you'll join the challenge. There is a really big win for you, if you enter and win the challenge. 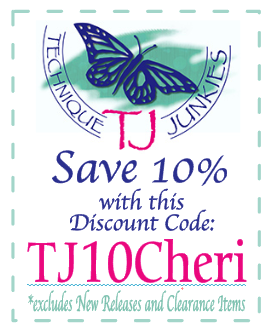 Once again, thanks for stopping by, and don't forget to take advantage of my discount coupon if you go shopping in the Technique Junkies store. Simply stunning SS. Beautiful in every way especially the sentiment. Love it..